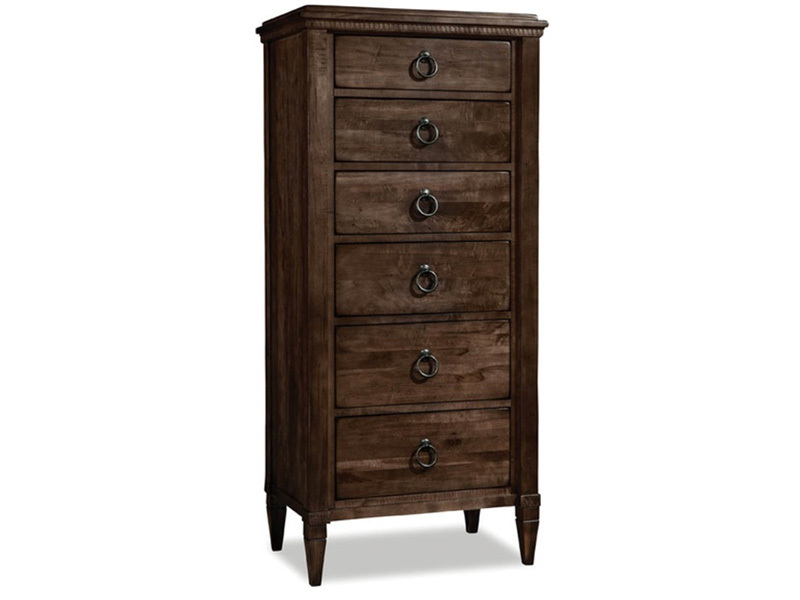 The Springville collection reflects the Gustavian era, naturally distressed maple captures the softened tops and carved under mount moldings. Flush mounted drawers open easily; lower cedar lined drawers offer protection. Finished with a round pull and a diamond key escutcheon, this collection offers a traditional appeal in a finish and texture that accompanies today's life style. A centuries old method of joining two pieces of wood, the mortise and tenon construction technique ensures structural stability. Cabinet corners are braced with blocks that are screwed and glued in place to add rigidity and prevent racking. A Flush wood back panel is framed by the top, sides, and bottom of the cabinet to provide added structural strength and elimate racking. Each drawer features 7/16″ solid hardwood sides and back with a three-ply bottom, sanded and sealed with coats of clear finish to protect your most delicate items. An English dovetail join connects the drawer front and back to the sides. It remains tight and snug after thousands of pulls. Raised panels on doors, sides, and beds “float” within the frame grooves. This allows for natural expansion and contractions of the wood and prevents cracks and splits. Wood dust panels are framed between each drawer to resist sagging and prevent dust from falling between drawers onto clean clothes. On average, drawers are opened and closed over 50,000 times in 40 years! Wood-on-wood treated drawer guides provide years of quiet smooth service. *Select sets now feature soft-close drawer glides. Ormes Furniture. You’re ready for the good stuff.